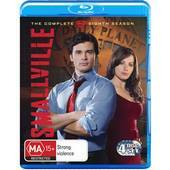 Being a comic geek, I’ve had mixed feelings about Smallvile but somewhere between season 1 and season 8, something profound and godly happened. And no, Clark Kent did not undress in a phone book to reveal a Superman suit but rather the characters grew and more specifically, elements of the DC Comics started to seep into the storylines. Another momentous occasion was the transfer from season 7 to 8 which saw Clark (Tom Welling) go from country boy to a reporter for the Daily Planet but unfortunately this saw a few regular cast members finally bow out. Even though Lex Luthor (Michael Rosenbaum), Lionel Luthor (John Glover), Kara Zor-El aka Supergirl (Laura Vandervoort) and Lana Lang (Kristin Kruek) would be leaving the cast as regulars, a whole new group of supporting cast would be introduced, including some impressive guest-stars from the world of comics. However, one strong link to Smallville remained though, Alison Mack as Chloe Sullivan, Clark’s confident and best friend who keeps our future Superman firmly grounded. Season 8 revolves around Clark finding himself in the world, more specifically the hustle and bustle of Metropolis. This has caused him to uses his powers more often which has also come to the attention of the denizens of this city and more specifically, Lois Lane (Erica Durance). There is even a subtle hint of romance between Lois and Clark and I’m sure as the series progresses, this will be made more evident. We are also introduced to photographer Jimmy Olsen (Aaron Ashmore) who adds to the Superman mythology and unfortunately not as annoying as the comic book version. Like the comics, the world of Smallville (it should be renamed to Metropolis) introduces some new characters to the franchise that include Green Arrow (Oliver Queen), played by Just Hartley, Doomsday (David Bloome) played by Sam Witwer and interestingly enough, both characters pay homage to their comic counterparts. Ever hero needs a villain and the viewers were introduced to Tess Mercer (Cassidy Freeman) who is acting CEO of the nefarious Luthor Corp and plays the perfect villainous, even though at times, she seems quite sincere. However, the best two guest stars in Season 8 of Smallville is the Legion of Super-Heroes, a group of super-powered youths from the 31st century (Cosmic Boy, Lighting Lad and Saturn Girl) plus the sensational Zatanna (Serinda Swan), the maid of magic who looks amazing in her Zatanna costume. These are some of the reasons that made season 8 so damn enjoyable because of the homage the writers pay to the original comics by DC Comics. Add in a variety of villains from Maxima to Parasite and even some returning guest-stars such as Black Canary and Martian Manhunter and this series has everything from action, romance, drama and heroics. Smallville just keeps getting better and better, whether it was the change in writers or the introduction of outside writers such as comic book legend Geoff Johns who really managed to flesh out the Legion of Super-Heroes, there is something just totally enjoyable in Season 8. The video quality of Smallville Season 8 looks quite stunning on Blu-ray with exceptional video, thanks to the 1080p transfer. The colours are all vibrant, the images extremely sharp that is easily one of Warner’s best releases to date. Add in Dolby Digital 5.1 and some of the action scenes sound phenomenal which really makes use of the surround sound experience. For special features, the collection contains featurettes, deleted scenes and commentaries to give the viewer a great behind the scenes pass of the making of this entertaining TV series, including some of the motivations for certain characters to appear and linking the world of Superman to the bigger picture of DC Comics. After 8 seasons, it’s good to see Smallville finally find its feet again from being lost in the wilderness for a few seasons. For the viewer, it’s great to be part of the ride again as Clark Kent finally moves towards his destination of becoming Superman but best of all, the links to the Superman mythology and world of DC Comics has come alive which only assists in the overall story experience, even if you are not a comic geek. With lots of new regulars and some interesting dynamics between new and old, Smallville comes recommended by Impulse Gamer!